Following several other recent actions in coin related legislation, President Obama has signed the Collectible Coin Protection Act into law. The Act will serve to broaden the existing Hobby Protection Act by making it unlawful to sell unmarked replica coins. The Hobby Protection Act, which was enacted in 1973, had made it illegal to manufacture or import into the United States for introduction into or distribution in commerce any imitation numismatic item that was not plainly and permanently marked “COPY”. However, the Act did not make the sale of such items illegal. In response to an influx of unmarked replica and counterfeit coins manufactured in China, there were calls from industry groups, professionals, and collectors to strengthen the decades-old Act to help combat counterfeits. In the 112th Congress, H.R. 5977: Collectible Coin Protection Act was introduced by Rep. Lamar Smith of Texas. The bill had 11 cosponsors and was referred to committee without any further action. Within the 113th Congress, two bills were introduced which contained the same provisions to amend the original Hobby Protection Act. H.R. 2754, which was introduced by Rep. George Butterfield Jr. on July 19, 2013, was passed in the House of Representatives on July 30, 2013 and by the Senate on December 15, 2014. On December 19, 2014, the bill was signed into law by the President. 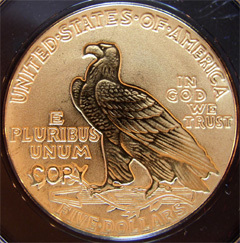 The Collectible Coin Protection Act strengthens the original Hobby Protection Act by now making the sale of unmarked replica coins illegal and also expanding the scope to include any person who provides substantial assistance or support to any manufacturer, importer, or seller if that person knows or should have known that the manufacturer, importer, or seller is engaged in activity that violates the act. Additionally, the law has been expanded to include the unauthorized use of registered trademarks belonging to a collectibles certification company. The owner of the trademark would have the remedies provided under the Hobby Protection Act as well as the Trademark Act of 1946. This new provision was added to specifically combat fake third party coin grading holders bearing the logos or names of legitimate coin grading services. I’m still trying to figure out where all these First Spouse boxes and certificates are coming from that I see for sale all over the place without coins. Who’s making those? They can’t all be separated from their coins. Usually I think the separate box & coa come from dealers or collectors who slab the coin and then no longer want to retain the packaging. That’s what I’d LIKE to think..however I’ve seen in the past cases of just the packaging for sale. Here’s a guy with 1000 for sale in Indiana…but he can’t sell to anyone IN Indiana…hmmm. wow. that is weird @bilbo. i dont like it one bit. A new law is not needed. The US Treasury can put a stop to this if they had the will to do so. These coins are still legal tender. Passing fakes is counterfeiting, and importing fakes is a causus beli.